The genre of post-apocalyptic or dystopian fiction used to be — with a few notable exceptions — almost the exclusive realm of works targeting an adult audience. Classics like George Orwell’s Nineteen Eighty-Four (1949) or Aldous Huxley’s Brave New World (1932) were rare enough themselves as examples from their own eras, but it’s fairly certain they would not have played well with an audience of children, or even pre-teens. Today is an entirely different story. One would have to have been living under a rock for the past couple of decades to have missed the gargantuan popularity of book series like Suzanne Collins’ The Hunger Games (2008-2010) or Veronica Roth’s Divergent (2011-2013) trilogy. And that’s just to name a few. There is now a multi-million dollar print and film industry which revolves around these types of stories targeting young adults. If you’ll allow for a minor philosophical indulgence how do we account for this explosion of popularity among young readers? After all, much post-apocalyptic and dystopian fiction deals with rather heavy themes and often depressing realities. Discarding for a second that the latter might be very attractive to a certain percentage of teenagers, much as it always has, it is tempting to brush off this new popularity of the genre as simple teen angst. The sheer volume and scale of this popularity, however, would seem to point to something deeper, and perhaps darker. The themes explored in this kind of fiction have always appealed to those who dream about remaking the world around them, usually to their own design. Glancing around the globe today one doesn’t have to look far to find examples of all the worst that humanity can offer each other. In a post-nuclear world where mankind still makes war on his brother and keeps his neighbour’s children starving, the idea of apocalypse no longer resides exclusively in the hands of an angry God. Do younger generations sense their proximity to disaster more readily than we? Do they seek out this fiction on a subconscious level because today’s insanity is inching closer to a post-apocalyptic reality? An impossible question to answer. But it is worth noting that the post-apocalyptic and dystopian genres of fiction are no less popular these days with adults than with teenagers, so perhaps we also sense the seeds of our own destruction are being sown with liberal abandon. One only needs to pick up a newspaper to draw their own conclusions. An early entry that helped kickstart the neo post-apocalyptic fiction movement in the 1990s, author Lois Lowry’s The Giver (1993) was a huge success, winning the 1994 Newbery Medal and selling more than 10 million copies worldwide as of 2014. In Australia, Canada, and the United States, it is on many middle school reading lists, but it is also frequently challenged and it ranks number 11 on the American Library Association list of the most challenged books of the 1990s. The novel follows 12-year-old Jonas as he navigates a society that has taken away pain and strife by converting to “Sameness” which has eradicated emotional depth from their lives. Jonas is selected to inherit the position of Receiver of Memory, the person who stores all the past memories of the time before Sameness, retaining the wisdom gained from history to aid the community’s decision making. Jonas’ Community lacks colour, memory, climate, or terrain, all in an effort to preserve structure, order, and a true sense of equality beyond personal individuality. The novel forms a loose quartet with three other books set in the same future era, which includes Gathering Blue (2000), Messenger (2004), and Son (2012). It should of course be remembered that Lowry wrote The Giver targeting certain ages and audiences, but the novel has cultivated a following among adults since its publication, and it is from this perspective that we are examining the work. While the story and plot of the novel are adequate to arrest one’s attention for the duration, like many young adult novels touted as significant for an older audience, The Giver largely fails to achieve the emotional depth and attention to detail older readers likely crave in their novels. While the structures of Jonas’ society are well developed, missing is much of any explanation of why his society developed this way, the inner workings of its politics, or how it might have been created. Also absent is any description or depiction of the suspected convulsions that we assume destroyed our current modern world at some distant time in the past. And it is here that logical conundrums crop up with troubling frequency in Lowry’s novel. Being left to speculate about causes and origins, it is hard to conceive of how a society like Jonas’ might be crafted in the first place. Unless imposed by top-down totalitarian methods of control — we see only scant evidence of this in the novel — would any society or people voluntarily give up the very things (from our perspective) that make life worth living to inhabit a monochromatic future blanched of all emotion? Conformity is anathema to most people who enjoy their freedoms, but it is held up as one of the most important pillars of this society. How this reversal into anti-values was achieved in practice is wholly absent from The Giver, and one suspects this was by Lowry’s design — she probably didn’t have any idea either. Give the reader an insightful explanation, and Lowry’s novel might have scratched more deeply at the surface of true greatness. And for the creators of such a society, what would eventually be the point? Eliminate all knowledge, all emotion, even colour, and what purpose is left? Taking the life out of life to preserve life doesn’t sound like a ideology about to burst at the seams with willing converts. For anyone who has experienced these things — which would be just about everyone, to one degree or another — it is difficult to conceive who would be willing to surrender their humanity just to stamp out the darker angels of our nature, like war, hate or greed. Although not entirely central to the novel, part of it revolves around Jonas’ discovery of reading through his interactions with the Giver. Reading is not banned or lost in the Community like we see in many other novels, but what can be read definitely is, not unlike Winston Smith’s occupation in Nineteen Eighty-Four’s Ministry of Truth. Once Jonas is freed from these rules as an apprentice to the Giver, he explores the history and philosophy of the past world, things denied to his family and peers. Not surprisingly, they eventually become to Jonas like the drug-addled children they actually are, bereft of all curiosity, knowledge, and wisdom. In this sense The Giver could be considered an unofficial sequel or companion to classic novels like Ray Bradbury’s Fahrenheit 451 (1953) or Walter Tevis’ Mockingbird (1980). In 2014, a film adaptation was released, starring Jeff Bridges, Meryl Streep and Brenton Thwaites. Bridges has said he had wanted to make the film for nearly 20 years, and originally wanted to direct it with his father Lloyd Bridges in the title role prior to that actor’s death in 1998. 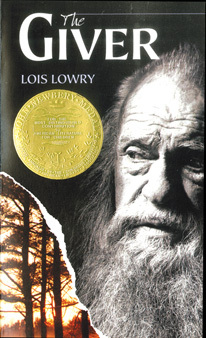 Although failing to answer some of the practical and philosophical questions surrounding plot structure that might be sought out by an older readership, Lowry’s originality and deft powers of storytelling manage to propel The Giver into something beyond the range of wasted time for an adult’s more discerning eye.